CCI Thermal Technologies offers the following Caloritech™ brand electric heat exchange products. The Caloritech™ IX Formed Unfinned Tubular Heater (Calrod® type) can be used in most heating applications that require process heating temperatures up to 750°C (1382°F). These tubular elements can be clamped, immersed, cast into metal or spaced away from the work as radiant heaters. They can also be positioned in ducts or vessels for heating air and other gases. These units can be factory formed into virtually any shape and may have inside bending diameters as small as one element diameter. All Caloritech™ tubular heater styles offer a selection of sheath diameters and material options, including copper, steel, stainless steel and Incoloy®. The Caloritech™ KX Finned Tubular Heater (Calrod® type) is typically manufactured to custom specifications based on the customer application. Steel fins are spirally wound over a heating element and then metallurgically bonded by furnace brazing, leaving negligable thermal resistance at the joint. This type of heater is normally used for forced convection heating applications with outlet air temperatures up to 300°C (572°F), such as forced circulation, air or gas heating systems like ducts, fan forced electric heaters, recirculating ovens and loading resistors. 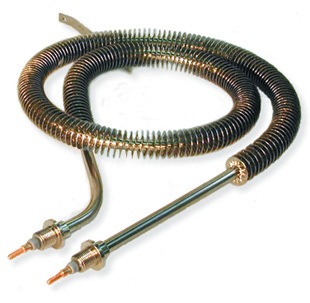 Finned tubular heaters offer distinct advantages over open coil heaters, including minimized risk of fire or electrical shock, longer service life and less required maintenance overall. 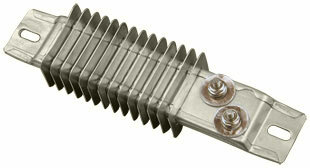 The Caloritech® SD Strip Heater with terminals at each end is a versatile and economical heating source typically used across a wide range of applications, including surface heating (platens, dies, molds, tanks, piping); process air heating (drying cabinets, ovens, baking ovens, vacuum dehydrating ovens, moisture protection for motors); dropping resistors for line applications in railroads and load banks; winterizing (hoppers, conveyors, ducts, car heating, thawing); and original equipment (air conditioning, laboratory equipment, food packaging, ovens, presses, drying equipment). 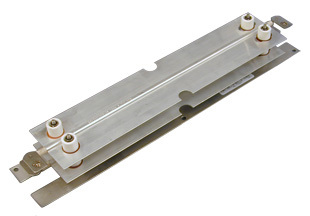 The Caloritech® FS Finned Strip Heater is a versatile and economical heating source used across the same wide range of applications as the strip heater. The fins in this heater design improve heat transfer in free or forced air heating applications. The Caloritech® FV Calvane® Heater is a compact, lightweight and economical electrical heating source that features durable Calrod® type construction for easy, efficient installation and long life. These heaters are used primarily in natural and forced convection heating applications, such as aircraft and transit car comfort heating. They are ideal for installations that require size and weight control where heater sheath temperatures below 316°C (600°F) can be maintained. 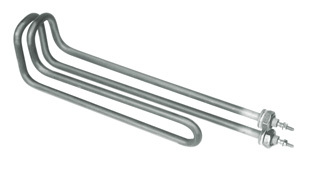 The Caloritech® BC Band Heater is an aluminized steel strip heater formed to a semicircle. 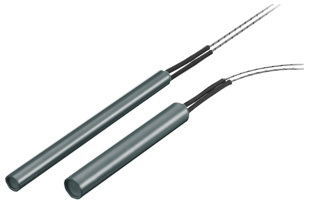 A spring at the terminal end keeps the heater halves in contact with the barrel and compensates for thermal expansion. The other end is fastened by a captive chrome plated allen screw for ease of installation. These heaters are typically used to heat the barrels of plastic injection and extrusion machines, kettles, pipes and other cylinders. The Caloritech® C Cartidge Heater represents the highest commercial grade of heater available on the market today. They feature high grade nickel chromium resistance wire uniformly wound on a premium quality MgO core and welded to termination points; the core is then carefully centered in a compacted and MgO-filled high temperature 321 stainless steel casing, and stranded leads with silicon-impregnated mica glass insulation are fixed to the termination points. These heaters offer a convenient and efficient means of heating metal dies, platens, molds, heat sealing tools, hot plates and more. 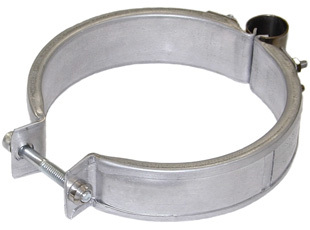 Most units can also be fitted with threaded bushings for liquid heating applications.